AHHHHHH. 20! We meet again! This is one of my hubby's favorite desserts (no, he's not into chocolate-- not sure why). It is such a light dessert and so easy to make! But, yes, combining sugar, sour cream, and whipping cream does equal a 20% dessert! In a medium saucepan, blend sugar and gelatin. Add water and mix well. Let stand for 5 minutes. Stirring constantly, bring to full boil. Remove from heat and whisk in whipping cream. In a larger mixing bowl, mix sour cream and vanilla. Slowly add sugar-cream mixture and whisk to mix. 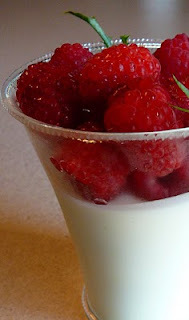 Place in individual serving dishes (martini glasses are pretty) and place in refrigerator for 3-4 hours or until solid. Add fresh seasonal berries of your choice on top. This is an awesome dessert!! Haven't meant anyone who hasn't liked it! Easy to make in a pinch!! okay I cant spell!! I havent met anyone who doesnt like it!! It is great to make when going to friends house for dinner and dont know what to bring!! !